Green roofs have the potential to support urban biodiversity. The conversion of natural land to cities means that more plants and animals need to live alongside people. Special rooftop gardens, called green roofs, could include plant species that have lost their normal living spaces on the ground. If plants are able to live successfully on green roofs, they could provide resources like food and nesting materials to many insects and birds. But green roofs can be harsh places for plants and animals to live because of high summer heat, wind, and UV radiation. If plants from harsh ground-level habitats were selected for use on green roofs, they may be able to survive both in the short and long terms. But it is difficult to replicate natural plant communities on green roofs and we are unsure what these communities will look like many years into the future. Green roofs, like other urban gardens, tend to be located far away from each other. Spaces between the roofs might not be good places for plants and animals to live, causing green roofs to act like isolated islands throughout a city. If plants on green roofs are not connected to other plant populations, inbreeding can occur between a few closely related individuals. Over time, this could mean that all individuals on a green roof were related and would share the same inability to respond to stressful situations like droughts. However, if green roofs received seeds and pollen from other locations, the plants could have a greater ability to adapt to changes in the environment. To date, little is known about how green roof plant populations are connected with plants in other habitats throughout cities. My research will determine the characteristics of plants that allow them to establish, survive, and even move to new green roofs. 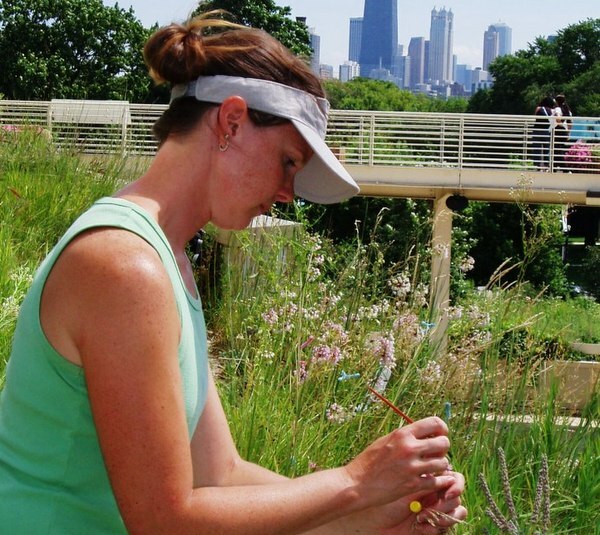 I compare the movement of pollen on green roofs to similar natural habitats and look at the useful services (like capturing stormwater and cooling buildings in the summer) that native plants can provide on green roofs. Results of this research will allow future green roofs to be designed to support diverse and resilient groups of plants.